Faster- For you picky snobs who have brand spanking new close-tolerance valves, and are crazy enough to think that your fingers could possibly move faster than our "Original" formula is able to keep up with, this is the juice for you. So fast. So smooth. Still long-lasting. Still a great choice for any instrument. Original- Our original formula valve oil. Best application for all-around, hassle-free, quick-action, buttery-smooth, long-lasting use. Takes forever to evaporate. Hide your kids, put on your sunglasses---this is the Monster Oil that will change the world. Appropriate for every trumpet ever made. Far superior to anything on the market today. You're welcome. Smoother- Some folks like to oil their valves once a year and be done with it. We cannot condone such poor instrument maintenance habits. 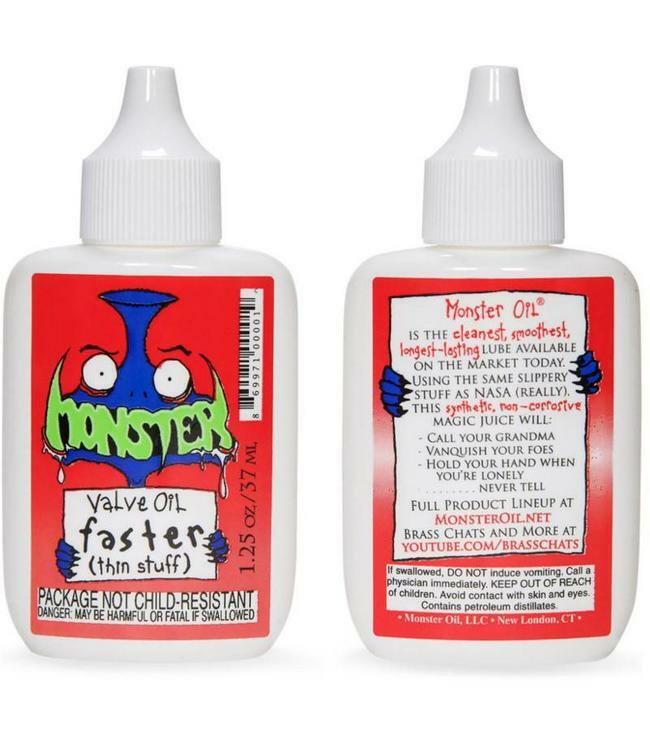 However, what we CAN recommend is Monster's "Smoother" oil--our heaviest oil formula appropriate for valves. Not only will you get the staying power that supports your lazier tendencies, you will get the smoothest action you've ever had from a valve oil. Have an older instrument with worn valves? This will make them behave nicely, and will help to seal the gap created between valve and casing due to your vast years of neglectful and abusive ownership practices. It's so smooth you will forget that your valves even exist. Look, just buy it.